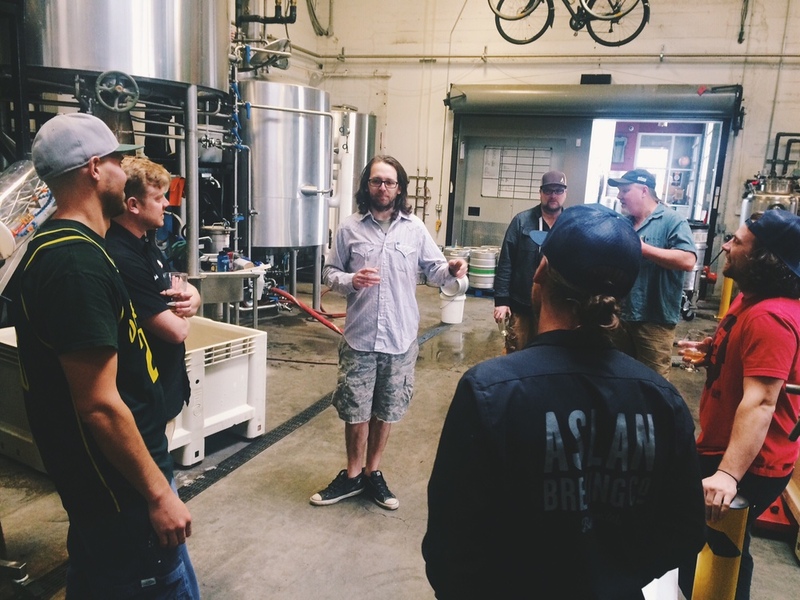 Blog — Aslan Brewing Co.
For this year's Washington Beer Collaboration Festival, we teamed up with North Fork Brewery head brewer, Eric Jorgensen. This deep red, moderately tart beer exudes flavors of dark chocolate and pie cherries. In the spirit of creative collaboration, we went a step further and dry hopped it with Nelson Sauvin to create a truly unique beer that exemplifies the strengths of both North Fork and Aslan brew. This special creation comes to you from the mind of Jenn Tadder, the **Bellingham Homebrewers Guild 2015 Homebrewer of the Year**. In addition to some new hardware for her trophy shelf, Jenn won the opportunity to brew a collaboration beer with our Masterbrewer, Frank, and will enter it as Bellingham’s first Pro-Am entry in the WA Beer Awards! The result is a delicately malty beer with notes of toffee, a soft bitterness, and a clean, refreshing finish. Base Camp Brewing Co. was in-house this last weekend to do the second batch of our collaboration beer. Our first collaboration happened down at Base Camp Brewing where we decided on an Imperial Steam Bock. So... Base Camp Brewing has a batch of Imperial Steam Bock and now we have a batch! In a couple weeks we will be releasing both batches with a name. We brewed beer, talked beer, drank beer and went on beer adventures. We had a blast working with the team at Base Camp Brewing Company on our 1st Brewery Collaboration. We went down and brewed a batch on their system and in two weeks they will come up here and brew the same style on our system. We'll release both in Bellingham and Portland. It's a great way for Aslan to get some fun exposure in Oregon and Base Camp to get exposure up here! The beer is an Imperial Steam Bock, not yet named. Look for a big event at each of our breweries in the next 6 weeks! !